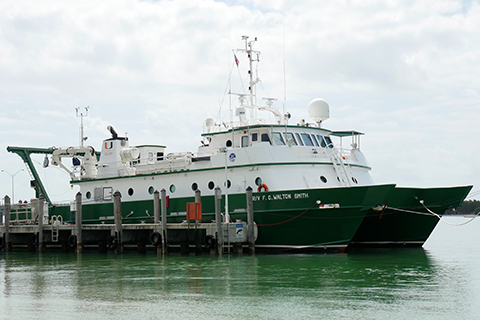 The Rosenstiel School's primary research vessel is the F.G. WALTON SMITH, named in honor of the School's founder. The WALTON SMITH, which was designed to the school's specifications, was built in 1999 and placed in service in late 2000. This state-of-the-art 96-foot-long catamaran is capable of reaching speeds of 10 knots with a draft of only 7 feet. This designed shallow draft enables the WALTON SMITH to explore the shallow water environments such as reefs, mangroves, and grass beds. 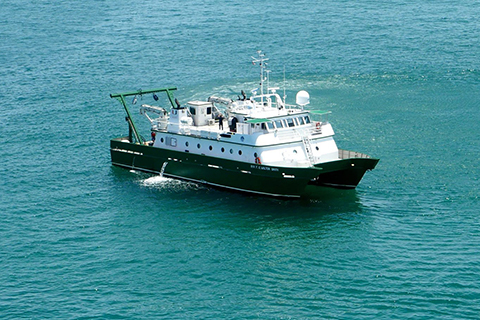 The vessel accommodates 20 people in its ten two-person staterooms and encompasses 800 square feet of laboratory space, as well as an additional 800 square feet of multi-use space astern. Constructed by Eastern Shipbuilding Group in Panama City, Florida, the catamaran boasts twin Cummins engines at 760 hp each, twin Servogear variable pitch propellers, twin bow thrusters, 10,000 gallons of fuel, and a reverse osmosis water maker which keeps 3,000-gallon tank full of fresh water. The vessel also has the capability of precise station keeping, using bow thrusters, controllable pitch propellers, and independent rudders. Other specialized instruments include a transducer suite that includes ADCP transducers for measuring ocean currents; a moon pool between the hulls for drilling or coring operations; and a notched stern to facilitate maneuvering equipment into the water using the A-frame. The WALTON SMITH is also equipped with a meteorological suite of instruments that includes wind speed and direction, air temperature, relative humidity, barometric pressure, and solar radiation. The weather stations are manufactured by R.M. Young Company. Radiometers are manufactured by Eppley Laboratories. A Li-Cor PAR is available upon request and may require pre-cruise calibration. The ship can be outfitted with a Nitrox dive compressor and up to four small boats for diving operations. The WALTON SMITH operates in accordance with the University National Laboratory System (UNOLS). As a UNOLS vessel, the WALTON SMITH conducts all of its operations in accordance with UNOLS safety standards, subject to regular, recognized ship inspection programs, scheduled by established UNOLS procedures and meet cruise reporting, cruise assessment, cost accounting and performance standards according to UNOLS practices.